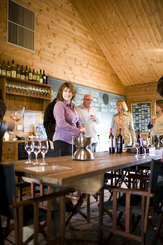 Cellar Door open from 11am - 5pm daily. Groups of 6 or more by appointment only, please call us on 08 8563 3606 or email cellardoor@charlesmeltonwines.com.au to make a booking. You will still be able to enjoy the same bucolic outlook and relaxed vibe whilst enjoying our superb range of wines by the glass. Private Tastings are available for groups of up to 8 guests on weekdays between 10:00am & 4:00pm, and on weekends from 10:15am. For more information and to obtain a booking form please email cellardoor@charlesmeltonwines.com.au or call us on 08 8563 3606. Awarded 'Barossa Best Small Cellar Door 2016' by Gourmet Traveller Wine magazine. Visit our unique cellar door and enjoy tasting our range of premium wines in a rustic and cosy setting. Guests can also taste or enjoy a glass of wine from our deck area alongside old bush vine Grenache, with spectacular views of the Barossa Ranges. Closed New Years Day, Good Friday, Christmas Day, and Boxing Day. Open at 12pm on ANZAC Day. Our Cellar Door carries a range of products to further enhance your tasting experience.